A string of questions which suggests the good work and the Nordic gestures of Visiontrick Media, a development study based of Sweden composed of two great individuals. On the first place, Henrik Flink, who lives in Tokyo and is a passionate person about programming and game development; and secondly, Rickard Westman, a creative visual artist who prints an unique personality in his works. Two friends, separated in the distance, decide to create a new video game. What is the true reason to work together and join in the video games indie scene? (Henrik) A couple of years ago we both attended the School Of Future Entertainment in Sweden, studying game development, visual arts and computer graphics. There we got acquainted with each other, and it was probably due to our love for David Lynch and Twin Peaks (1990) that brought us together in the first place. And ever since we’ve kept contact with each other. (Rickard) Yeah, “School Of Future Entertainment”, that’s a great and insanely broad name for an education. It’s weird how David Lynch and Twin Peaks seems to be echoing in the indie game scene all over the place, but that’s where our friendship started I guess. Other than that I think we make for a good dynamic duo, seeing things from different angles and complementing each other. After talking back and forth about different game concepts for a couple of years we chose the strongest one and applied for a government grant (Nordic Game Program) in April of 2012. We were very fortunate to get that grant, which then led us to quit our day jobs and start working on Pavilion full time. Probably the most scary and rewarding work related thing I’ve done so far. But sometimes life is about seeking opportunities and grabbing chances. In another interview, Locomalito, spanish indie developer, said «freeware is a very important movement for him because he’s able to create with freedom, working with no pressure of the bosses, publishers, customers and launch dates». Do you think that the alternative movement of the video games makes poss“ible to create a free game with no restrictions? (Rickard) Innovation is something that will bring video games forward and I think you need a bit of freedom to be able to go beyond where others have been before. On the other hand you need to be open about letting the creation guide you and follow what is best for the project. Some games are meant for small scale development and others needs to be done in a bigger fashion. And it might not always be up to the developer to decide that, sometimes you just discover things during development that needs to be done at a certain scale to have just the right impact. Pavilion definitely became bigger when we started to go deeper into the mechanics and the world. (Henrik) I think the right amount of freedom and the right amount of pressure is healthy when creating something. You want to be free enough to have time for a throughout exploration of your concept and also the time to execute on that concept. But then I also feel that a little bit of pressure is good, it will make you proceed and force you to come to conclusions about your concept, not getting stuck too long on details or technical specifics. But this could be a personal preference so at least for me it’s good to have some pressure and deadlines. (Rickard) Yes, I totally agree with the pressure and deadlines, otherwise it gets really hard to complete things. On the other hand, many major publishers have removed filters and restrictions for indie games. Which is the role that indie games could play in the next generation of consoles and mobile devices? (Rickard) Indie games have a big role to play, as have the major company games too. Though I think a lot of indie games that are being developed today are leaning too much on a retro trend, where you simply recreate games that you love but in a new outfit. So, if indie games are going to play that big role I think we need to focus more on innovation rather than a pre made formula. Otherwise some indie games are almost doing the same thing as the major companies, but as the major company makes a sequel to one of their own games, indies make a “sequel” to someone else’s game. Of course, everyone should do what they enjoy to do, nothing wrong with that. But games are about mechanics and interaction and that is where I would love to see more focus. (Henrik) I like that there’s a market for indie and niche games, that we’re moving away from the hit driven industry we’ve become. In which the indie scene plays a big part, but on the other hand, as Rickard said, it wouldn’t hurt if more independent developers chose to go a bit wild and do something unexpected instead of rehashing ones childhood experience. I think recent releases such as Kentucky Rout Zero, Year Walk and Proteus among others is a great showcase of the potential of the freedom that more independent creators will have in the future. 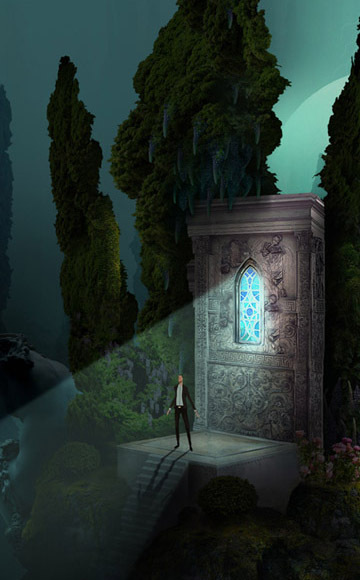 Taking a look at Pavilion, I have a critical doubt: the fourth person video game. Correct me if I am wrong: An external being can manipulate, guide, influence and use subliminal control with the environment. It’s an absolutely brilliant concept! How have Rickard Westman and Henrik Flink imagined that new gameplay? When and why it happened? (Rickard) It started with us developing a maze puzzle game. The player was faced with a blocked off maze where she needed to clear a path from start to finish. What we discovered there was that there was no purpose or need for a player controlled character in a game like that, which then led us to think about the player and character relationship and the fact that you can build a game where you do not directly control the main character, but rather steer the character by manipulating things in the environment. (Henrik) This was also something that affected the whole aestethic of the experience, transforming it to something more contemplating and laid back rather than on action and instant gratification. We wanted to put the focus on the exploration of the “player – character” interactions which also dictates the puzzle design in that they are designed to highlight and put focus on certain “player – character” interaction instead of challenge the player. If someone could actively manipulate all these elements surrounding you it would make for an interesting interactive premise. This idea was something we wanted to capture, put in a focused environment and suit for a puzzling and interesting experience. (Rickard) I don’t think I believe in an external being, the word belief feels somewhat foreign to me. I don’t think I have ever experienced that feeling of believing in something that is pretty much unexplained. I am more drawn to acknowledge facts though I imagine that there are a lot of things that we don’t understand or can back up by facts. (Henrik) Yeah, not more than the existence of some collective consciousness that we all act under to some degree. (Rickard) Carl Gustav Jung, who’s work on collective consciousness is very interesting, said that he knew for a fact that God exists, and even if I can’t share his belief I can respect it and be entangled by his way of being certain of something which I can’t understand. I still would like myself to be open to these things and the best way of getting an opinion about something is to gain perspective. As game developers the only thing we really feel is built upon facts and needs to be communicated is the game’s mechanics. The rest of Pavilion has a more subjective form and is up to the player to experience, partly from within themselves. (Henrik) Speaking of delivering story or meaning through an interactive experience, one of our goals with Pavilion is not to directly imply any meaning onto the player but rather let Pavilion be a framework where the player can develop his or hers own beliefs and interpretations. Regarding the fourth person perspective, I am trying to understand how it works and how could affect to the main character in this story. Is the average player prepared to understand this new idea? As for the gameplay, are we going to act as a master puppeteer or the interaction with the main character is more subtle? (Henrik) We hope that players will go into the game with an open mind and a curiosity to understand how the underlying systems of the world is working. There’s also no real failure state in the game to encourage the player to explore and experiment without feeling the risk of losing or having to repeat a segment of the game. So we hope this will contribute to players taking some initiative and try to find out how you can utilize the interactions to influence the character in different ways. So the basic interactions are not something we will convey through tutorials but instead let the player take the first step towards understanding the rules. (Rickard) Conveying this basic interactions and rules in a less handholding way is something we have put a lot of effort into. It is actually very much a new way of thinking about gameplay. There are a few fundamental notions about how a game should be played that we have approached in a nontraditional way. So you could say that there is a couple of gamer instincts that we need the player to try to let go of. What this gives though is a nice sense of discovery with the realization of how the game mechanics work. Something that was crucial then was to find specific interactive elements that could give the mechanics depth and still be consistent and easy to interact with. We very much aim to make this a focused and fluent experience. Pavilion’s world takes a clear reference in the impossible constructions and the isometric drawings made by M.C. Escher. Could it determine the way it’s meant to be played? (Henrik) This is something we’ve been asked a lot about and it was in fact something that came pretty natural when experimenting with the level design due to the isometric perspective. At the same time we also had to be careful when designing levels so they would make sense in the perspective, it’s really easy to make levels that doesn’t make sense. (Rickard) We also want to create things in context and each aspect of the game should have a purpose and a place. The Escher rules would not apply everywhere. (Henrik) Although you might find it in some parts of the game world, parts that make as much sense as the Escher perspective does. As Chris Priestman asked you in this IndieStatik interview, the work of Rickard reminds the paints of Caspar David Friedrich and Arnold Böcklin: Romanticism, Symbolism and landscape art. Now, the question is: how important are the fine arts for Visiontrick Media? Do you think that was necessary to make an art study previously in order to enhance Pavilion‘s visual aspect? (Rickard) I have pretty much always been attracted to these artists and I absolutely love the feel of having an environment that plays with all the rules of the actual world but at the same time has a surreal and otherworldly feel to it. For me this visual direction is very important because it lets me enjoy creation, especially on a big project like this. I guess I could say it is also a bit selfish, where I do what I love to do. I consider myself very lucky being in this situation. Otherwise, inspiration comes not only from the romantic painters but from everywhere, movies, books, life. (Henrik) I think before deciding on this art style we just had a notion of a certain mood and feeling that we wanted to convey. And since Rickard was a big fan of this art style we tried it out and it married perfectly with the mood we had imaged, and then later on, the tunes of Tony Gerber that we’re collaborating with on the music added another layer to the whole atmosphere. The composition of these elements, audio, visual and interactive was something we were very keen on getting right. In the last years, many video game critics and a few indie developers like Phil Fish maintain that the japanese industry is dying. We know that you like to be aware of the situation in Japan. What’s your opinion about that stance? (Rickard) Dying is probably the wrong term. Maybe it is just a matter of branching off in different directions. I don’t think they will stop making games just because the critics don’t like where they are going. In some years it has probably turned around again. (Henrik) I still think allot of the Japanese mainstream games are viable and successful in Japan but the problem is that they’re not catching on enough in the west to be called “successful”. And I don’t think the solution is to imitate the western developers but instead focus on their own strengths, the creation of new creative ip’s instead of mass-producing sequel after sequel. The rise of the Japanese indie scene will probably play an important part in the future of the Japanese games industry. In the West we don’t hear much about indie japanese developers. How do you see the indie scene in the Land of the Rising Sun? What could you tell us about the first BitSummit event? (Henrik) Up until lately it has not been very vocal or visible for the public eye. To my disappointment, even for me who is living in Tokyo it has been kind of hard to find Japanese indies to the extend of the western indie scene. But it’s definitely coming more and more events and gatherings directed to indies in Japan, so it’s just a question of time until it will blossom. BitSummit was just fantastic! Seeing so many talented developers coming together under the same roof was definitely a sign of the bright future of the Japanese indie scene. And I really hope this will spark more Japanese developers to go independent and a widened recognition of the Japanese indie scene. And not to forget, a big thanks to James Mielke over at Q-Games for organizing such a great event. (Rickard) Yeah, wish I could have been there, next year we both will attend! But good to have Henrik on that side of the globe though, to manage things. So far emails crossing. The meditations take their end and mediate words with Rickard Westman and Henrik Flink is more than a pleasure. (Rickard) Thanks a bunch for having us Sergio, those questions where great! Yo escribía biografías con gran elegancia hasta que se volvió mainstream la dote de redactarlas en tercera persona. Magical Drop III pro-gamer y monoculopaster reconocido, Twitter es mi habitat natural: ahí es donde somatizo todos mis perjuicios.